WATERLOO – Ready to start or scale a social enterprise? The Schlegel Centre for Entrepreneurship and Social Innovation at Wilfrid Laurier University is now accepting applications for a new program called Start@SIVC. At Laurier’s Waterloo campus, the program is specifically designed to meet the needs of female social entrepreneurs. The program aims to provide participants with the mentorship and confidence-building resources they need to succeed. 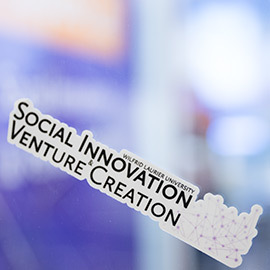 “Start@SIVC incorporates Laurier’s strengths in entrepreneurship to bring social and economic benefits to applicants looking to start and scale their business,” said Joanne Benham-Rennick, executive director of the Schlegel Centre for Entrepreneurship and Social Innovation at Laurier. “We know that more social enterprises are being founded by women and there are very few support services to help them establish their businesses. Social enterprises can be for-profit, non-profit, co-op or other business models that address complex social issues with sustainable, collaborative and impactful strategies and approaches. At Laurier’s Waterloo campus, ideal participants for Start@SIVC will be females who either have already launched or are ready to launch a social venture, and who would benefit from an environment geared specifically to serving and supporting women founders. Start@SIVC is also available on Laurier’s Brantford campus and is designed for all social entrepreneurs with no previous business training and/or little to no post-secondary education. Designed especially for those who might never have imagined themselves in a university setting, this program in Brantford opens the doors to entrepreneurs who want to learn and develop new businesses. Start@SIVC is part of the Ontario Social Impact Voucher (OSIV) program that was launched by the Ontario Centres of Excellence to encourage the development of social innovators and entrepreneurs. The Schlegel Centre for Entrepreneurship and Social Innovation is one of Canada’s longest-running post-secondary organizations dedicated to entrepreneurship education for Laurier students and alumni. The centre supports programs taught within Laurier’s Lazaridis School of Business & Economics and the social entrepreneurship program, provides opportunities for Laurier students to work within the entrepreneurial community, and facilitates the incubation of student business ideas through an array of entrepreneurship experiences for Laurier students, including courses, active student clubs, high-impact co-curricular programs, as well as access to Laurier’s large network of alumni entrepreneurs. For more information on Start@SIVC or any of the Schlegel Centre for Entrepreneurship and Social Innovation’s other programs, please visit www.sivclaurier.ca. For further information, or to register, email schlegelcentre@wlu.ca.